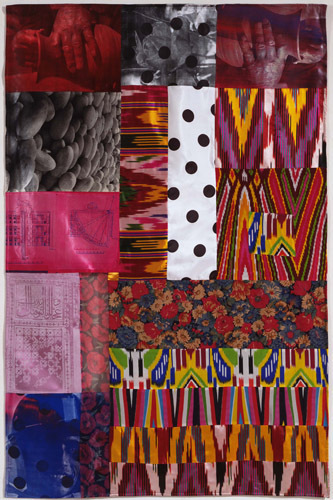 Robert Rauschenberg, Samarkand Stitches #IV, 1988, assemblage with ikat silk, domestic fabrics, and screenprinting, 61 x 40". From the series “Samarkand Stitches,” 1988. Art history is rife with instances in which limitations—financial, material, spatial—sparked inspiration, but for thirty-five years, Gemini G.E.L. provided Robert Rauschenberg with the exact opposite of restriction. The results of the long and overwhelmingly positive relationship between the artist and print studio reflect Rauschenberg’s exuberance and the unique environment provided by Gemini. Founded in 1966 and still run by two of its founders, Sidney Felsen and Stanley Grinstein, Gemini offers its invited artists free rein and seemingly unlimited resources to make prints and multiples. Rauschenberg, one of the earliest and longest-lasting participants, took the process further, transforming the idea of what a print could be. This exhibition includes numerous examples of Rauschenberg’s work with Gemini over the years, providing a vibrant view of their unique process and, tangentially, of the artist’s development from the 1960s through the latter part of his life. The selection, curated by Jay Belloli, represents a lively mix of lesser-known works—lovely gold-leaf-edged collages made as a result of Rauschenberg’s journey with Gemini staff to the world’s first paper mill in China during the early 1980s; subtly varied fabric prints from the series “Samarkand Stitches,” 1988, inspired by a trip to Uzbekistan later that decade—alongside numerous silk-screen prints and some quirky multiples, notably the altarlike “Publicons” from the late ’70s. The range of materials—mud, steel, wood, Mylar, string, cardboard—points to an ongoing dialogue between Rauschenberg’s prints and his celebrated Combines, while editions produced as a result of travels suggest the impetus for his work with cultural exchange and ROCI (Rauschenberg Overseas Cultural Interchange) later in life. Playful in the best sense of the word, the exhibition is grounded in what reads as a firm commitment on behalf of the artist to take advantage of the possibilities afforded by Gemini, drawing on an array of media and processes while gradually but doggedly pushing the definition of printmaking.